Panoramic view from the ridge of the Treskelen peninsula over almost the whole of of Hornsund. 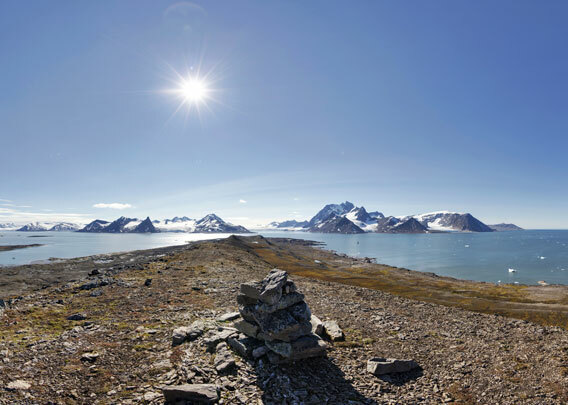 From here, you watch over Brepollen, the innermost bay of Hornsund, with its surrounding glaciers. You can see the famous mountains Bautaen (“the monolith”, towering needle-sharp and 475 m high over the entrance to Brepollen) and Hornsundtind, a 1429 m high carbonate massive standing directly on the south shore of Hornsund. Hornsundtind is the highest mountain in southern Spitsbergen. The bay Brepollen, the innermost part of Hornsund, is now wide-open, but it was completely filled by the surrounding glaciers Storbreen, Hornbreen and Chomjakovbreen as recent as in the early 20th century. The bay Brepollen simply didn’t exist back then.